Lock in a great price for San Carlo Garni – rated 8.5 by recent guests! Location was the best and room was great, right above all the action going on in the streets below. The staff was also EXCELLENT!! The staff was WONDERFUL! Helpful in every way possible. The candy bowl was a big hit with the children. The location was excellent. Only one minute to view Lake Lugano. The room had the basics. The value of the room for the cost was very good. Makes an ideal location quite affordable for travellers. The heat and fan both worked very well. The windows opened for fresh air. The market next door was a bonus. Try the pretzels! Room was very cean and comfortable, slept well. Staff very friendly and helpful. Breakfast good and plenty of choice. Notwithstanding the negatives, the San Carlo is still a great value in the heart of Lugano Centro, and its still very clean and inviting. Staff were generally cordial and competent, if not as warm as before. Good size of room and excelent place, have parking lot near to hotel. Location, for visiting the heart of the city, was excellent. It seems to be a family run hotel (preference! ), an older facility so small-sized, some recent updates. All the front-desk staff we came across were helpful, friendly and patient. The location of the property to the center of town. It was easy to get too from the train station. All of the staff were very friendly and assisted in any way that they could. Great location close to everything. Property description was spot on. Very central, close to the lake, clean and friendly staff. 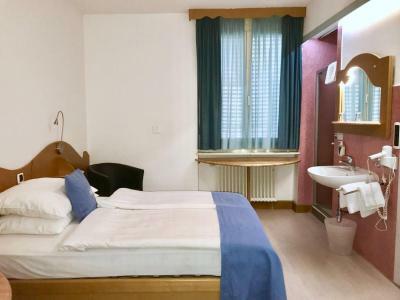 This hotel is in an ideal location and is a terrific value. Not only is it in the center of Lugano amidst the fancy jewelry stores but it's a 2 minute walk to the main square. Immediately next door is a market where you can buy drinks, food, clothing and anything else you might need. A public parking garage is a short 5 minute walk up a stairway. Our room was clean and well furnished and the area seemed quite safe. 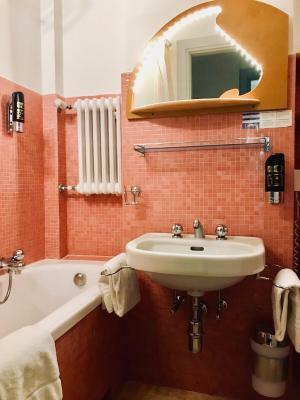 San Carlo Garni This rating is a reflection of how the property compares to the industry standard when it comes to price, facilities and services available. It's based on a self-evaluation by the property. Use this rating to help choose your stay! 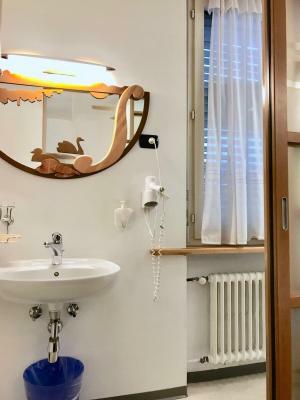 Located in the center of Lugano, on the elegant, pedestrianized Via Nassa close to the lake and the funicular, the San Carlo Garni hotel offers free internet in all rooms. 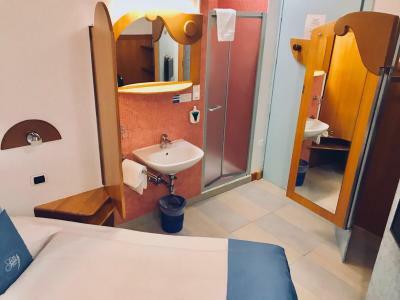 All rooms have a private bathroom with a hairdryer and satellite TV. 뀐 Located in the real heart of Lugano, this property has an excellent location score of 9.5! 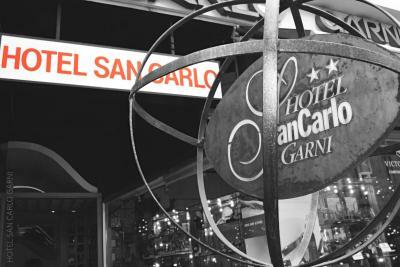 When would you like to stay at San Carlo Garni? 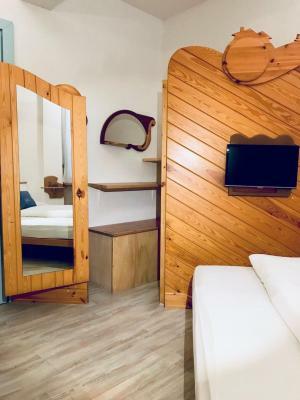 Room with cable TV and a bathroom with a hairdryer. 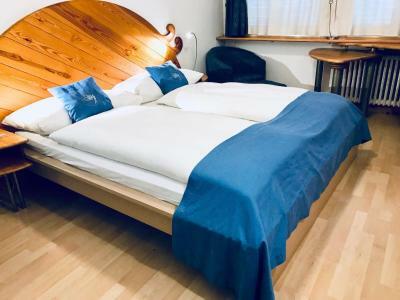 Please indicate in the comments field whether a double bed or 2 single beds is preferred! 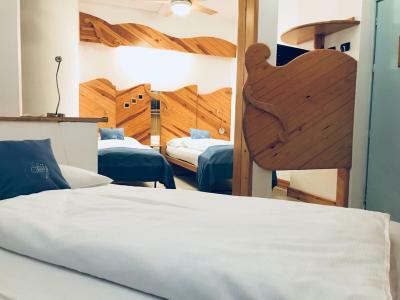 This is a double or a twin room with an extra bed. This room has 2 single beds and a double bed and 2 TVs with cable channels. 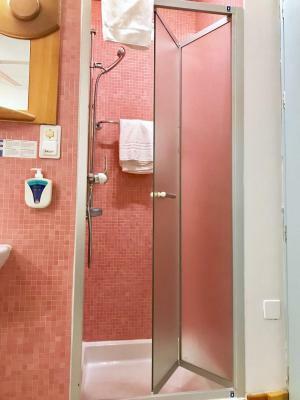 This single room features a cable TV, tile/marble floor and private entrance. House Rules San Carlo Garni takes special requests – add in the next step! San Carlo Garni accepts these cards and reserves the right to temporarily hold an amount prior to arrival. Room stank terribly of cleaning products, almost suffocating, as well as the elevator. Room was a bit dark and cold. Walls very thin, sounds amplified from other guests and cleaning staff in the morning yelling in the hallway. Perfect for shopping, lots of brand name shops are surrounding. No complaints. The lack of air conditioning might be a problem during hot summer days. However, there is a huge fan at the ceiling. I stayed in that hotel for 13 nights. So, I know what I am talking about. Take it from me, this is an outstanding hotel. I found everything in good order. It has all the modern comfort and conveniences one likes to have. Friendly and very helpful staff. You feel welcome and at home. This is the place to be. Good breakfast. A huge fan at the ceiling. The neighbourhood is safe and very quiet at night. It's located on the main pedestrian shopping street of the city. Shops, supermarket, cafes and restaurants close-by. The lake is just around the corner, the bus stop is at a 1 minute walk max, the boat landing at a 2 minute walk. Best location in town. Poor breakfast. Inconvenient if you are travelling by car. No parking. 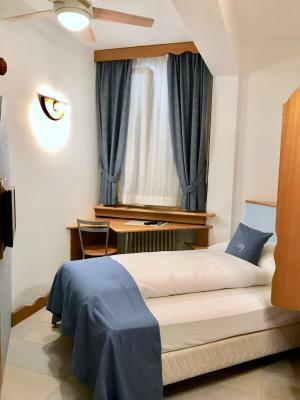 Excellent central location in pedestrian zone of Lugano. Friendly and helpful staff. It was a bit far from the train station but taxis were easy to call. The location was fabulous - close to shops and the foreshore. Very central location. Close to funicular (to and from the railway station) and to the lake. Very helpful personnel. There is a supermarket (Coop) and numerous shops and restaurants nearby. There's an elevator. And Lugano itself is a very gorgeous town. The pillows were too soft! Great central location - the lake at your doorstep, close to shops and a supermarket too. The room is of a decent size and the bathroom sparkling clean. Decor abit dated otherwise everything else is perfect! Close to shopping and close to lake. Friendly staff. The rooms have very thin walls. You can hear the phone signal and all the sounds in a neighboring room. Hotel was very clean. Location is very good. The place is clean, near to shopping and the train station. There is a cable car direct from train station to the shopping area and walk less than 5 mins to reach the hotel. Staff is friendly and helpful. My dislikes were not due to anything the hotel caused. Noisy guests and street noise. *Just bring earplugs or headphones in case you encounter the same. Note: The owner thoroughly apologized for the noisy guests, though I didn't really hold them accountable. I only mentioned it in case they were putting anyone else in the room the next night. Luckily for everyone, the noisy people checked out. Would have liked a kettle in our room.